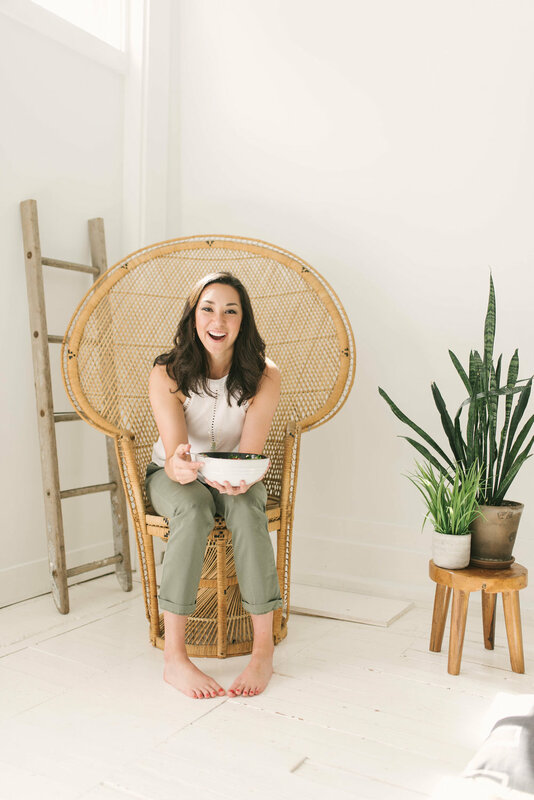 I'm rather excited to finally be able to share my Q&A with this month's #gamechanger, Cara Harbstreet of Street Smart Nutrition and Libre Connections. Cara is a wonderful RD based in Kansas City who aims to "...help people rediscover joy in eating deeply nourishing meals without restriction or fear". She works with a weight-inclusive approach as a dietitian and shares some amazing insight into how to find freedom and joy around food whilst prioritising both your body and mental wellbeing. I can so resonate with all of the 'unknowns' that Cara describes as she has navigated her way through university to professional practice, and am inspired by all of the amazing work she has done and is doing. I really enjoyed reading through her responses to these questions and hope that you do too! Also, be sure to check out her newest Libre Connections Podcast episode with Rachel Hartley that will be released during the course of today. I’m Cara Harbstreet, registered dietitian and founder of Street Smart Nutrition and Libre Connections. My first few years in dietetics was spent in a very weight-normative setting (community nutrition, corporate wellness, retail, and outpatient clinical) but I eventually learned about intuitive eating, HAES (Health at Every Size) and a non-diet approach. When I formed my private practice in 2016 I was committed to adopting a weight-inclusive approach to my work as a dietitian and I’ve been enjoying the process ever since! How have you got to where you are today in your career? I followed a pretty traditional path through my undergraduate studies - although I didn’t start out as a nutrition major, I was a college athlete and eventually become more interested in how nutrition can affect performance. At the same time, I became really interested in the food system after taking a course in world agriculture. After my undergrad, I faced a year of unknowns after I didn’t match for a dietetic internship (DI). I was devastated but still committed to continuing my efforts to become a dietitian. The following year I successfully matched and went on to complete my DI and MS program. The start of my private practice also stemmed out of a year of unknowns. My corporate position was dissolved and in a short amount of time, I found myself without a reliable source of income. We had just bought a house and were planning our wedding and it was incredibly stressful as I started scrambling to look for a new job. I formed my business with the hope that it might lead to a few work opportunities until I was able to secure a new job. But once I saw the potential of private practice I wanted to grow it to the point that I could make it my full-time job. I was able to do that in 2017 with Street Smart Nutrition and have since formed a second company, Libre Connections. Now I’m focused on the growth of opportunities in both areas (consulting/blogging/nutrition communications with Street Smart Nutrition and virtual services for a non-diet approach with Libre Connections). I think keeping an open mind and learning to recognize opportunities has been really key to my success so far. I also give credit to mastermind groups and becoming involved in state and national groups (my state affiliate for AND and the SCAN DPG) for helping me create relationships and learn to effectively network. How do you approach to nutrition and wellness, and how has that approach changed over time? How has it not changed?! As with a lot of dietitians, I was never exposed to IE or HAES in my formal education. I wasn’t even aware it existed until I started connecting with more dietitians on social media and exploring the topics on my own. It resonated with me because I had faced my own struggles with disordered eating, compulsive exercise, and body image and I recognized how that approach could help not only me but also the patients and clients I work with. It was challenging to let go of the food rules I used to live by and I really needed to reevaluate my relationship with exercise. But once I did that I discovered how much happier I was and how it made me a better dietitian. It’s still tough to work in weight-normative settings, especially since a lot of colleagues aren’t informed about IE or HAES yet. But it’s also been encouraging to see how there are many others like me who have embraced it and are taking the initiative to commit to a weight-neutral approach and share it with their clients and colleagues. What are some of the most difficult struggles you faced as a nutrition & dietetics student? As a student-athlete, my time was often not my own. I had to do a lot of work in managing my time to make room for everything - studying, volunteering, projects, work, practice, travelling for meets. Looking back I don’t think that was any more challenging than managing it all at any other point but I didn’t think that at the time! After I didn’t match for a DI I had to deal with a lot of anxiety and imposter syndrome. It really pulled the rug out from under me and I questioned if I had what it took to become a dietitian. It was tough to rebuild my confidence but I eventually matched to a program that led to a lot of opportunities - so as cliche as it sounds, it all seemed to happen for a reason and worked out in the end. What are some of the things that you have enjoyed most about your studies and career thus far? Some of the best experience I’ve had have come from stepping outside of my office and interacting with other dietitians or experts in other fields. I’ve been fortunate to attend several sponsored farm tours to learn about the food system and the people who produce our food. It’s been helpful for me in feeling more confidence in my own food choices, but also for my clients who have a lot of questions about the safety and quality of their food but don’t necessarily have the resources to find answers they can trust. I also think attending conferences has been fun and rewarding - it’s one of the few times each year where I get to hang out with “my people” (other dietitians in private practice or those who also work with IE/HAES) and it’s opened the door to partnerships with brands and other organizations that helped me grow my business. It is a lot of work - don’t get me wrong - but it’s also really, really fun and something I enjoy and look forward to doing. What are three of your top tips for staying healthy physically, emotionally and mentally? Be resilient - When you decide to reject the diet mentality, it’s tough. You’re constantly bombarded with diet talk and messages from diet culture. And it’s not easy when you don’t see many other examples. But trust that your decisions to commit to your version of health and well-being doesn’t have to match anyone else’s. Resilience against diet culture gets stronger over time and there is an active community who is there to support you if that’s the path you wish to take. Be open-minded - curiosity is something we lose when we outsource our food decisions to diets, fads, or the advice of other people. Asking questions about how food makes you feel, what you enjoy most, or what it is you really need can help you stay committed to your values and live them out unapologetically. Asking questions also helps you become a more informed and empowered eater because your decisions aren’t based on fear or myths. So keep your critical thinking hat on and don’t be shy about questioning something that doesn’t sound quite right or seems too good to be true. Be kind - to yourself and others. It’s so easy to beat yourself up about skipping a workout or for something you ate, but that can quickly spiral down. If you can extend kindness, understanding, and compassion to others I encourage you to try offering that to yourself. Find forms of self-care that are meaningful to you and find outlets for your stress. And remember that no single meal or day can derail your efforts to achieve well-being. What is your favourite go-to meal to make after a busy day? I really love a toasted fried egg sandwich - it’s a quick and easy meal that works well when we’ve run low on ingredients or time. I make mine with sourdough bread (buttered and toasted), a slice of mozzarella or gouda cheese, and an egg or two. I’ll add fresh spinach or a few slices of onion if we have it, it’s one of my favourite comfort foods! What is your favourite thing to do to wind down and relax? I’m a runner so I use that as a form of stress relief. If I’m training for something it might involve an actual workout, otherwise I just pick one of my favorite routes through my neighborhood or a local trail and head out for a chance to unwind. I already really enjoy listening to podcasts so I’ll listen to those while I work on a craft project or walk my dog! Any last words of advice for girls (and guys) who want to live healthier, happier lives? A mantra I’ve been using lately is, “I don’t have to justify the ways I take care of me”. You don’t have to follow any strict rules when it comes to your health and happiness and you don’t need to defend your choices. You are the expert of your body so don’t be shy about advocating for it if you need to!